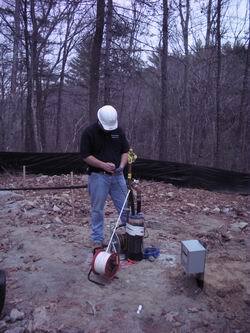 Groundwater Development Services - Northeast Water Solutions, Inc. Groundwater can be an extremely reliable and cost effective water supply option for many clients, and often may be the only source for developing a water system. A successful groundwater exploration program is dependent on targeting sites for wells that will produce the greatest sustainable yield and highest water quality available in a given area. This goal is achieved by understanding the interaction between hydrologic and geologic environments and the structure of subsurface formations to target wells in the most productive locations. Developing a groundwater supply requires expertise in several areas, including hydrogeologic data collection and management, structural and surficial geology, remote sensing, geophysics, drilling technology, borehole inspection surveys, pump test design and aquifer analysis, groundwater flow modeling and well rehabilitation and development methods. This multidisciplinary approach and our unique adaptation of geophysical exploration methods first developed for use in the oil industry produces results that greatly increase the probability of success for projects of any scope. Our groundwater team has decades of experience in all areas of groundwater exploration and a proven track record of successful water supply projects in diverse and challenging environments, both in the US and overseas. Let NWSI put this professional expertise to work in developing high yield, high quality groundwater supplies for your project needs.